Earlier, the second phase was scheduled from the Bharatpur division on August 20. It was postponed in view of the seven-day national mourning announced after Atal Bihari Vajpayee''s death. The Rajasthan Gaurav Yatra will be Vasundhara Raje's biggest public outreach programme. 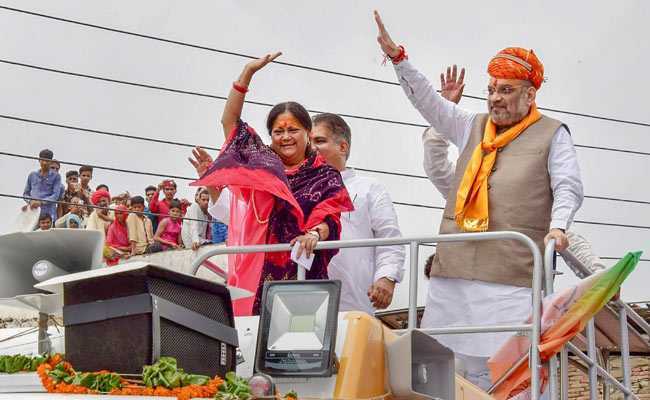 The second phase of ''Rajasthan Gaurav Yatra" being taken out under the leadership of Chief Minister Vasundhara Raje will start from Jodhpur division on August 24 instead of Aug 20, said state media in charge Vimal Katiyar. The second phase will comprise a 7-day yatra in Jodhpur region beginning Aug 24 and will continue on Aug 25. There will be a three-day break due to festival period. The yatra will resume from Aug 29 to Sep 2, said Mr Katiyar. A distance of 1,285 km will be covered in this phase over 33 assembly areas. Overall, 20 public gatherings will be organised. On Aug 24, the CM will fly to Jaisalmer where she will address a public gathering following which she will offer her prayers at Ramdevra temple situated in Pokhran. Chief Minister Vasundhara Raje started her ''gaurav yatra'' from Aug 4 from Rajsamand. The first phase of the yatra covered Udaipur region.